The PM is wrong in saying Vajpayee never buckled under pressure. Prime Minister Narendra Modi paid glowing tributes to Atal Bihari Vajpayee at the all-party meeting to condole his death on August 20 in Delhi. Speaking about Vajpayee, Modi said, "Atal ji never buckled under pressure and never lost hope despite the odds stacked against him." True, Vajpayee steered the BJP's ship to power despite heavy odds. Vajpayee was himself accused of supporting the Babri Mosque demolition. Also, leading a coalition government was no mean achievement. Modi might have some lessons to learn from Vajpayee in how to run a coalition government given that a fractured mandate is being predicted for the 2019 Lok Saha polls. But the question to be asked is was Modi speaking the truth with regards to Vajpayee? Did the former PM really not buckle under pressure? The answer is — no. Vajpayee had indeed buckled under popular pressure in his criticism of Modi in the context of the Godhra carnage and the Gujarat riots that followed. I was an India Today correspondent in Gujarat when Vajpayee gave the famous 'Raj Dharma' advice to Modi during a press conference in Ahmedabad on April 4, 2002, following the massacre of Muslims in central and north Gujarat as a reaction to the killing of 59 karsevaks in Godhra on February 27, 2002. As the news spread through TV channels and local newspapers, sympathy for Modi increased while the liking for Vajpayee dropped drastically because the Hindus in Gujarat felt that as PM, Vajpayee should have also given a few words of advice to the Muslim community leaders who were trying to play down the Godhra incident, which actually led to the Gujarat riots. 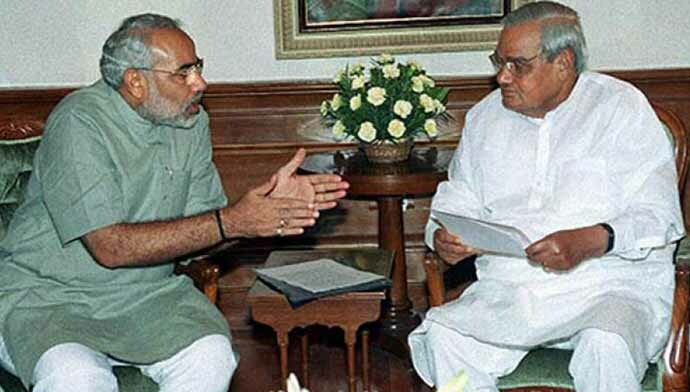 On April 11, 2002, a day before the BJP National Executive in Goa where the pro-Vajpayee camp in the party had decided to remove Modi as Gujarat chief minister, I got a call from someone close to Vajpayee at around 10pm. The caller was supposed to brief Vajpayee and other leaders on the Gujarat scenario during the PM's flight to Goa to enable him to take a decision on Modi ahead of the executive committee meeting. 1) Where did Vajpayee ji stand in public eyes in Gujarat? 2) What was LK Advani ji's standing? 3) Where did Narendra bhai Modi stand? Vajpayee's standing was at the lowest ebb because he gave a tough advice to Modi but didn't have a word of advice for the Muslim leaders who were underplaying the Godhra incident and overplaying the post-Godhra bloodshed. Advani was only two steps above Vajpayee because he had been missing from Gujarat in a time of crisis for over a month despite being a MP from the state. Modi's popularity was at its highest because this one-sided, pro-Muslim narrative had miffed people and turned him into a Hindu hero who was being victimised. I also told the Vajpayee aide about how the Hindu upsurge against Muslims post-Godhra riots also had its roots in the rise of Wahhabism in Gujarat in the form of many violent incidents triggered by religious fanaticism. The caller was stunned when I shared some of the incidents with him which included the story of a Deobandi madrasa student from Gujarat. The student who hailed from Kashmir had joined the militant ranks just two months before the Godhra carnage. I also told him that just a month before the incident, a section of Deobandi Muslims of a village Tankaria in Bharuch district had slaughtered dozens of cows and were selling beef openly in the village as though in a legitimate meat market. My words perhaps made some sense to the caller because the very next day, Vajpayee used some particularly harsh words against the minority community in Goa. Vajpayee's plans to force Modi to resign had to be shelved because some young turks in the party rallied behind Modi. There were signs of a public revolt if Modi was forced to resign. Clearly, Vajpayee buckled under pressure.